Hutchinson-Gilford progeria syndrome (HGPS) is a very rare genetic disorder characterized by premature ageing, severe growth failure, and very early onset atherosclerosis. Psychologically and emotionally child-like, these patients suffer from physiological changes of old age. Early and progressive atherosclerosis of intra-cranial vessels in HGPS patients, along with a thin skin and fragile vessels, make these patients susceptible to intra-cranial hematomas following relatively trivial injuries and to severe intra-cranial disease. Anesthetizing HGPS patients for surgery can be challenging due to the presence of a possible difficult airway, multi-system derangements, and associated skin, bone and joint disease. We report here one such child with HGPS who underwent craniotomy and evacuation of an extradural hematoma that developed after minor head trauma. Securing his airway during surgery was difficult. Hutchinson-Gilford progeria More Details syndrome (HGPS) is an extremely rare genetic disorder pre-dominantly affecting male Caucasians (incidence ~1 in 8 million live births). It is characterized by pre-mature ageing, severe growth failure (average height ~100 cm, average weight ≤12-15 kg), short life span (mean survival age ~13 years) and very early onset atherosclerosis manifesting as cerebrovascular and coronary artery disease. ,, Atherosclerosis of the cerebral vasculature can predispose HGPS patients to intra-cranial hematomas even with seemingly minor trauma. We report here one such child with HGPS who underwent craniotomy and evacuation of an extradural hematoma that developed after a minor injury; intra-operative tracheal intubation difficulty was encountered in this patient. A 7-year-old male child, known case of HGPS since 1 year of age, developed a right parietal extradural hematoma following a minor fall while playing. He presented with headache and nausea, was conscious but confused, and had no sensory-motor deficit. An emergency craniotomy and hematoma evacuation were planned. Pre-operative evaluation revealed a history of slow growth, progressively appearing features of ageing, normal intellectual development, and recurrent chest infections. The patient had typical manifestations of HGPS-like, a small thin built (height ~95 cm, weight ~11 kg), pinched nose with small nares, depressed nasal bridge, dry stretched-out skin, prominent veins, alopecia, sunken eyes without eyebrows and eyelashes, small pigeon-shaped chest, overall stiff joints, few missing teeth, a 2.5 cm inter-incisor gap, and normal mentation [Figure 1]. 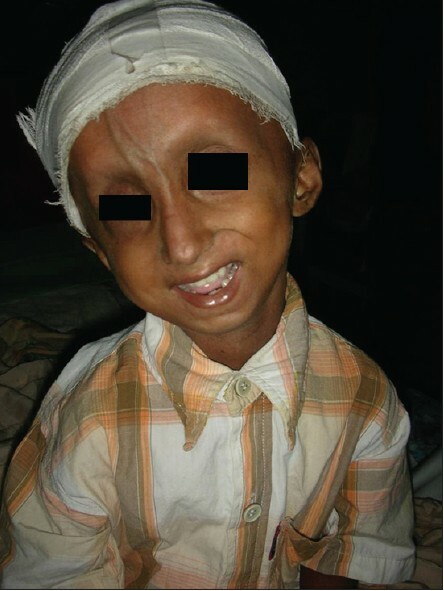 The presence of a disproportionately large head, mandibular hypoplasia, micrognathia, and class-3 Mallampati airway score was suggestive of a difficult airway in him. There was no evidence of cardiac, respiratory, or other systemic illness, and all relevant investigations including echocardiography were normal. Before the start of anesthesia, a well-equipped intubation cart and facilities for emergency tracheostomy were readied in anticipation of a difficult tracheal intubation; pediatric fibreoptic bronchoscope was not available to us. Direct laryngoscopy under deep inhalational anesthesia in the spontaneously breathing patient revealed a high, anterior larynx with non-visible glottic opening. After three attempts that utilized various intubation-facilitating maneuvres, it was possible to secure the airway with a small-sized (4.5 mm), uncuffed endotracheal tube with the help of an intubating stylet. The patient's remaining intra-operative course was uneventful; gentle patient positioning and handling during surgery and maintenance of hemodynamic stability were ensured. The child had an unremarkable post-operative period and subsequent hospital stay. Thus, the need for immediate attention in children with progeria even after relatively trivial trauma cannot be over-emphasized. The Author would like to thank the patient for providing consent to use his photograph in this article. 1. Russo-Menna I, Arancibias C. The Hutchinson-Gilford progeria syndrome: A case report. Minerva Anestesiol 2010;76:151-4. 2. Nguyen NH, Mayhew JF. Anaesthesia for a child with progeria. Paediatr Anaesth 2001;11:370-1. 3. Liessmann CD. Anaesthesia in a child with Hutchinson-Gilford progeria. Paediatr Anaesth 2001;11:611-4. 4. Mandera M, Larysz D, Pajak J, Klimczak A. Epidural hematomas in a child with Hutchinson-Gilford progeria syndrome. Childs Nerv Syst 2003;19:63-5. 5. Stehbens WE, Wakefield SJ, Gilbert-Barness E, Olson RE, Ackerman J. Histological and ultrastructural features of atherosclerosis in progeria. Cardiovasc Pathol 1999;8:29-39. 6. Rosman NP, Anselm I, Bhadelia RA. Progressive intracranial vascular disease with strokes and seizures in a boy with progeria. J Child Neurol 2001;16:212-5. 7. Stehbens WE, Delahunt B, Shozawa T, Gilbert-Barness E. Smooth muscle cell depletion and collagen types in progeric arteries. Cardiovasc Pathol 2001;10:133-6. 8. Neema M, Babar AK, Sharma P, Tewari A. 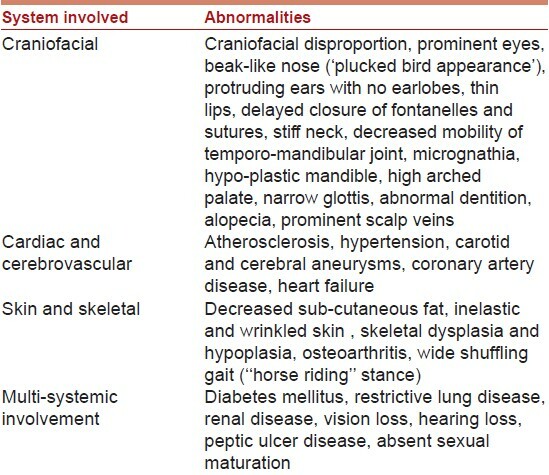 Our experiences in a patient with Progeria syndrome. Indian J Anaesth 2012;56:203-5. 9. Merritt S, Greenberg M. Successful airway management in a patient with progeria. Internet J Anesth 2010;23:1. 10. Singh KV, Patil Y, Dave S, Dewoolkar LV. Anesthesia management of a known case of progeria for functional endoscopic sinus surgery. Internet J Anesth 2007;12:2.